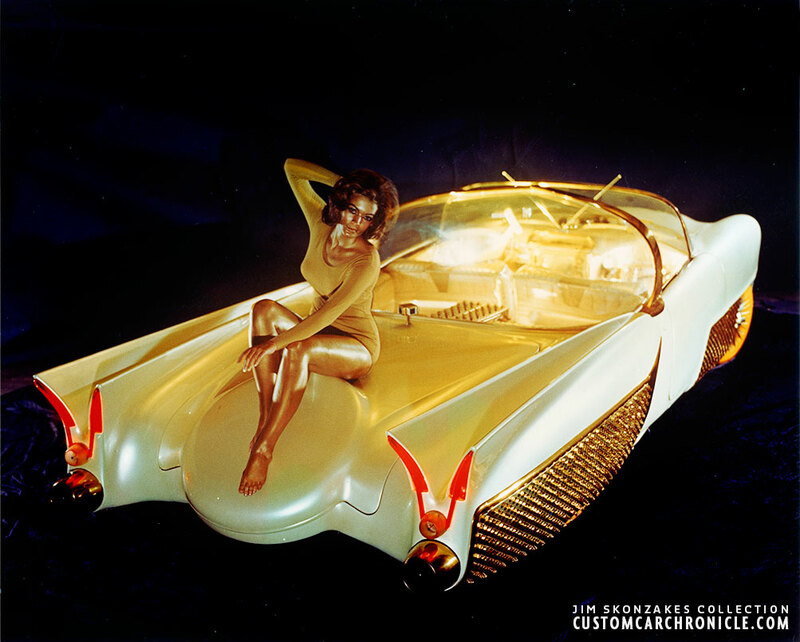 Jim Skonzakes had created his Golden Sahara II around 1958, filled with the latest technology. When Goodyear developed a glow in the dark tire in the 1960s, Jim stepped in and help develop some for his Golden Sahara II. 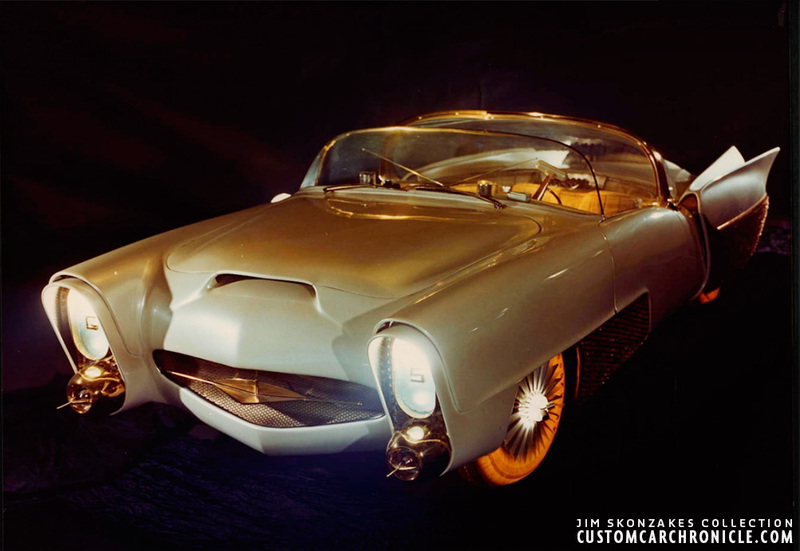 In the late 1950’s Jim Skonzakes (Street) was touring his Custom Car extraordinary, lab on wheels, the Golden SaharaII all over the US. The car was filled with every state of the art electronic device. Techniques developed specially for the Golden Sahara, or modified from known systems. The car had voice control, several steering wheel options, radar control that stopped the car automatically and many other special featured. In the years prior Jim had used the Golden Sahara as promo vehicle for tire brands, special exhibitions etc. Everybody wanted to have the Golden Sahara on display or use it for some sort of promoting, since where the Sahara went, there was an audience. From the Goodyear Triangle Newsletter September 1968. 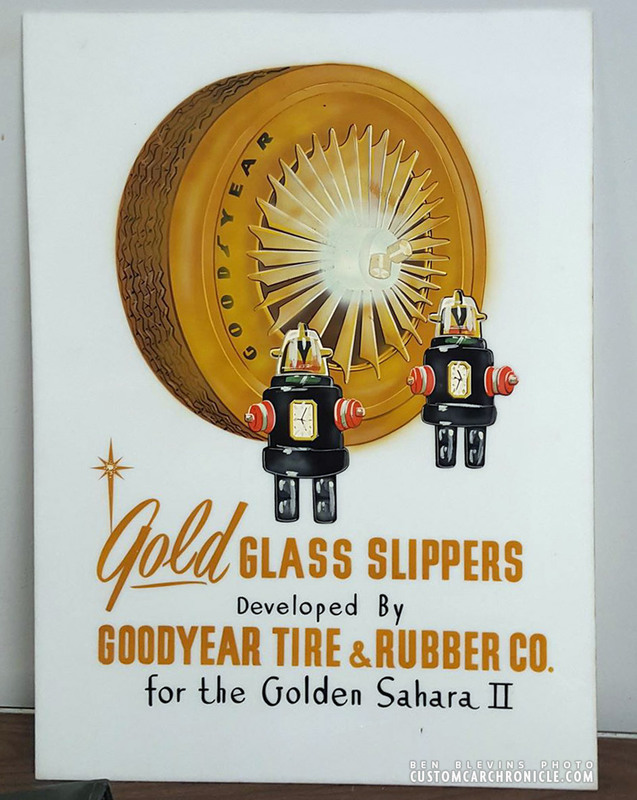 When the Goodyear Tire & Rubber Co was experimenting with glow in the dark tires they reached out to Jim to see if he would help develop the product, and promote it with his futuristic Golden Sahara. Jim, always looking for new state of the art technology, was very interested. And together with his friend and master engineer Henry Meyer, they developed a special wheel and hub to make the glow in the dark tires look absolutely amazing. Jim had the glow in the Dark tires on the Golden Sahara for many years, and people at the shows always went completely nuts when they were illuminated. Below is an interesting story about the Goodyear glow in the dark tires I found online from www.ohio.com. Motorists slammed on their brakes and pedestrians froze in their tracks. Crowds gathered at intersections to stop and stare. A sleek white convertible cruised the streets after dusk. Its four tires glowed a fiery red, blinking and winking at gawkers. The lighting effect was as startling as it was beautiful. 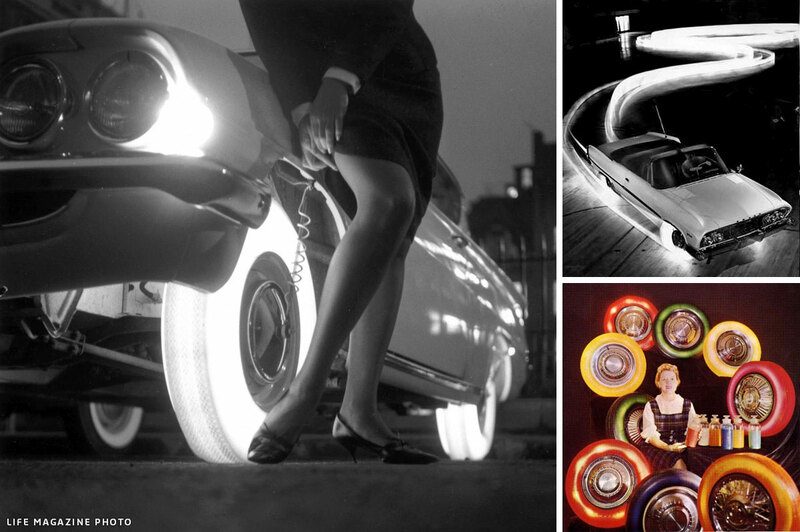 In the early 1960s, Goodyear Tire & Rubber Co. conducted colorful experiments on ‘’the tire of tomorrow,’’ a translucent model with tiny light bulbs mounted inside the wheel rim. 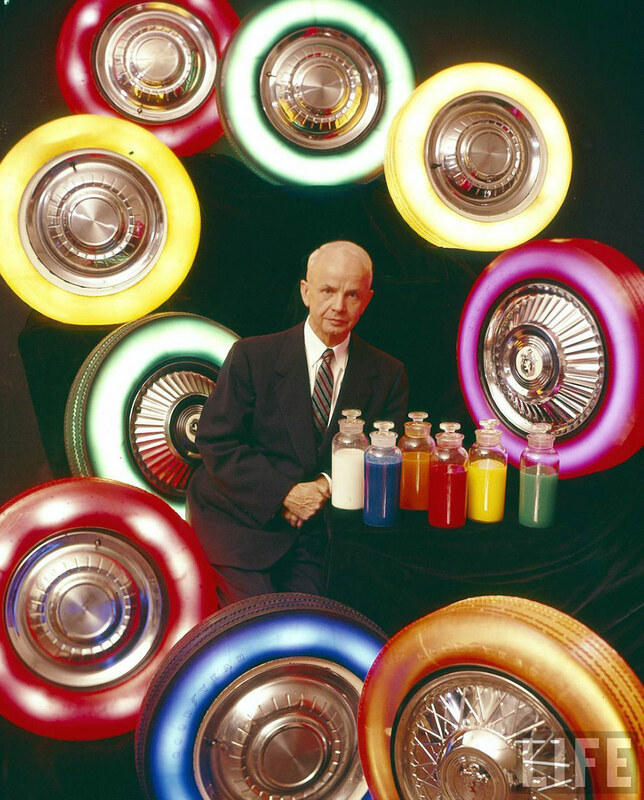 The Akron company predicted a revolution in ‘’future auto styling’’ when it rolled out exotic tires in shades of blue, yellow, red, green and orange. 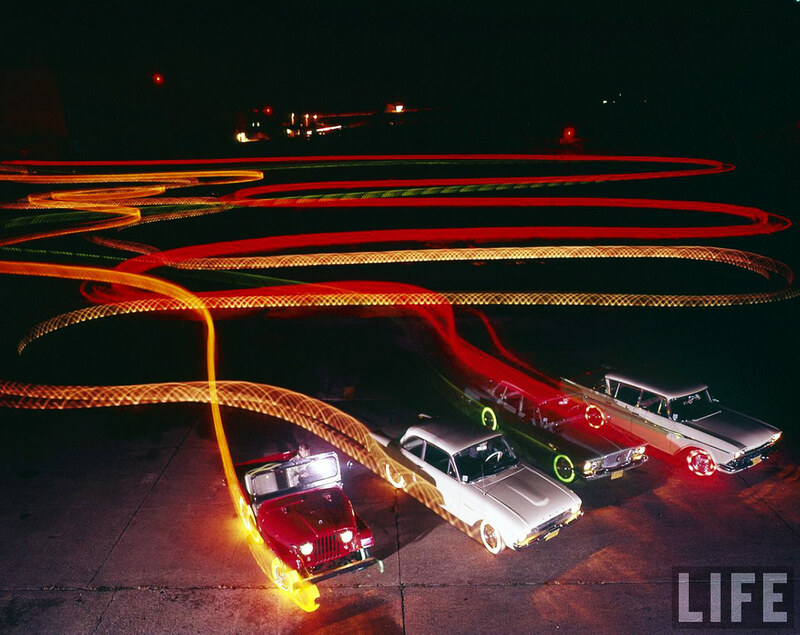 For one shining moment, glow-in-the-dark tires were the hottest thing on wheels. Life magazine photos from the Good year Glow in the dark tire experiments. 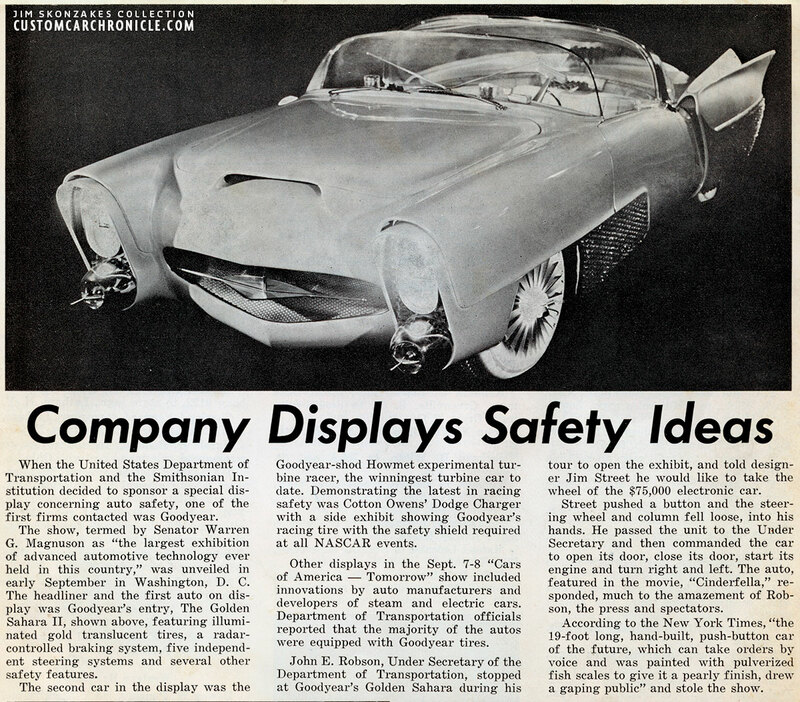 Larson developed the process in the late 1950s with Goodyear chemist Anthony F. Finelli. 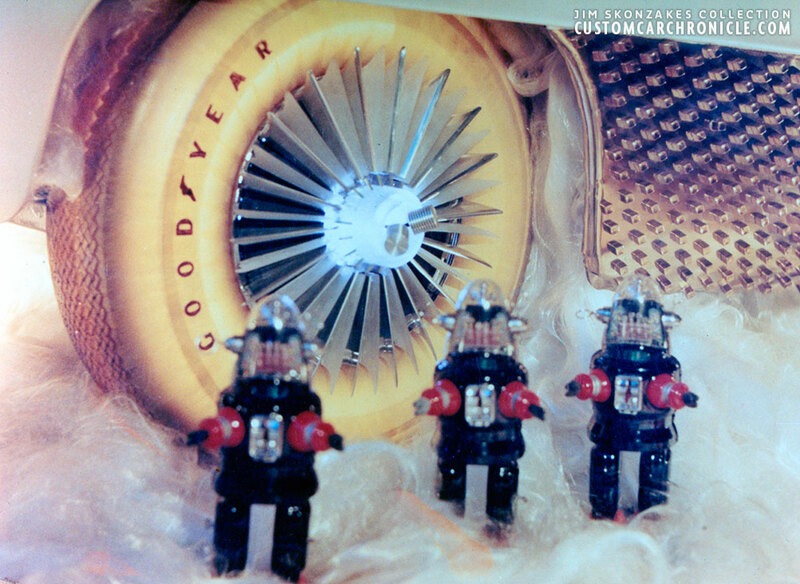 Neothane was Goodyear’s trade name for a polyurethane compound derived from petroleum and synthetic chemicals. 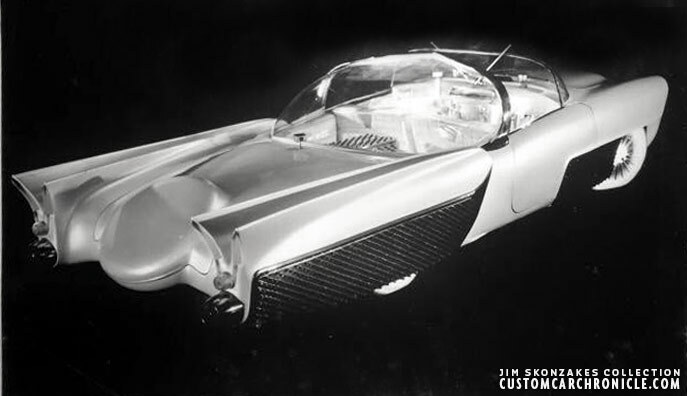 The molecular structure was similar to ‘’a three-dimensional fishnet.’’ The cordless, tubeless tires resisted punctures and cuts, and performed well in road tests up to 65 mph. Engineers installed 18 tiny bulbs in each rim to make the wheels shine in the dark. Wiring devices supplied electricity to create an eerie glow. 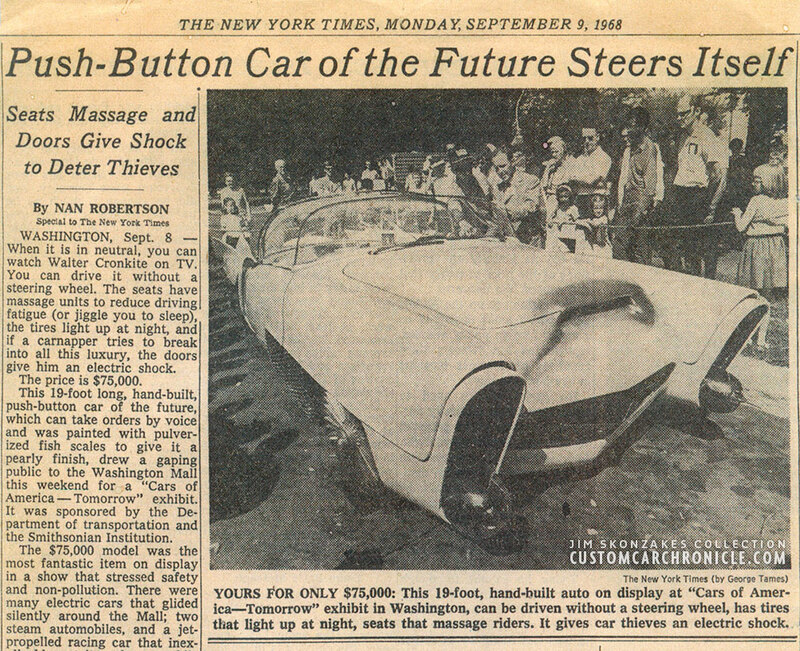 A control switch inside the automobile allowed a driver to make the tires blink individually or in unison. Goodyear invited Life magazine to visit the Akron testing ground in 1960. A photographer took beautiful nighttime pictures of cars decked out in green, yellow and red tires. A reporter noted that the tires could improve auto safety in bad weather or be wired to light up when the driver hit the brakes. However, street tests were causing some confusion. 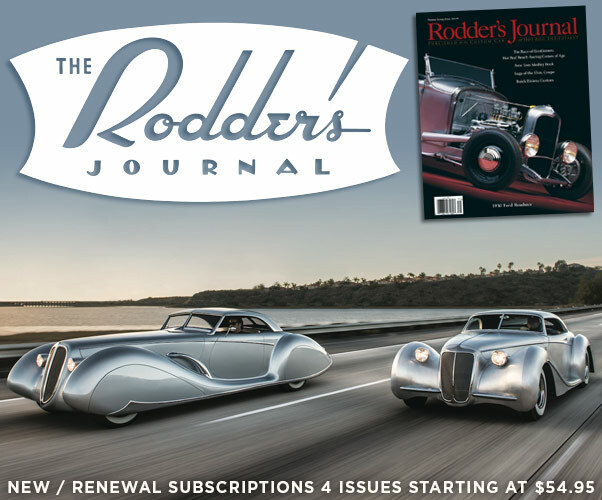 ‘’Other motorists have been so enthralled by the pretty colors that they have gone through red lights or just stopped to stare,’’ Life magazine reported. ‘’We still have a lot of work in developing this tire, but it takes only a little imagination to see it as the tire of the future,’’ Goodyear research and development director Walter J. Lee said. Although they weren’t in showrooms, the tires continued to cause a stir at public exhibits and parades. A glowing red wheel dazzled visitors at the World of Rubber museum at Goodyear Hall. The U.S. Information Agency borrowed a tire for the ‘’Plastics USA’’ exhibit that toured the Soviet Union. Communists from Moscow to Kiev waited in line for hours to view the latest in American ingenuity. It’s anyone’s guess how many Soviets were left with the impression that all U.S. cars had incredible devices. Article on Jim’s Golden Sahara II in the New York Times mentioned the light up at night tires. 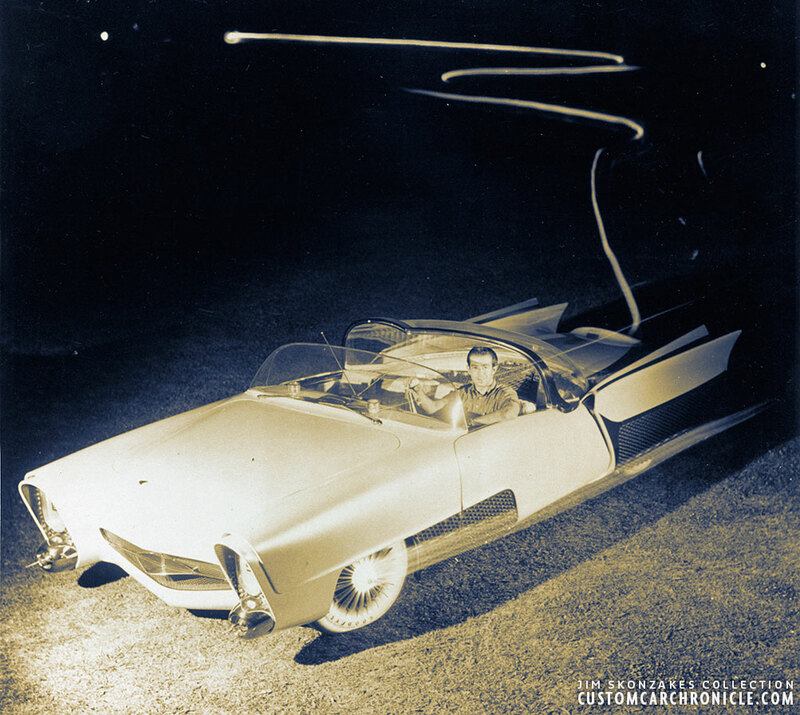 Wonderful photo showing the illuminated GoodYear tires as well as the light coming from the unique completely hand made hubcaps. The best known photo of the illuminating tires on the Golden Sahara is this photo showing Jim’s first wife Gloria painted gold posing with the Sahara in a dark studio with the tire lights on. 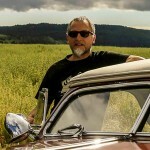 The photo was used on a promotional postcard as well. 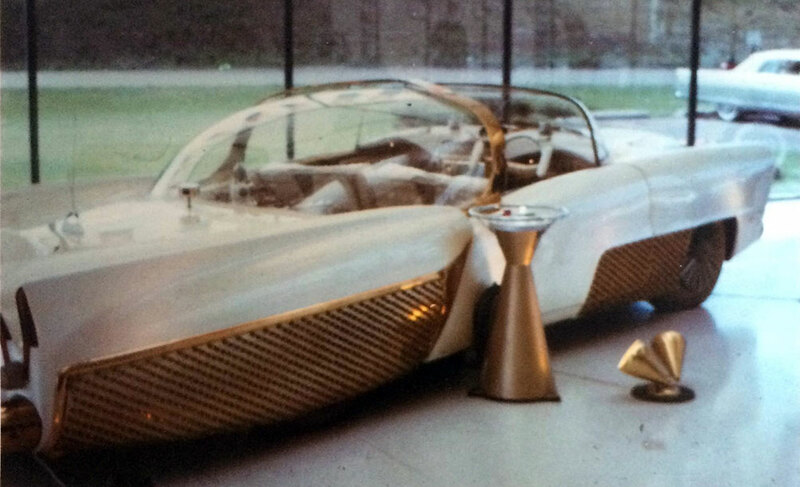 Goodyear allowed only one private collector to put the futuristic tires on an automobile: Dayton resident Jim Skonzakis, a custom car owner better known as Jim Street. 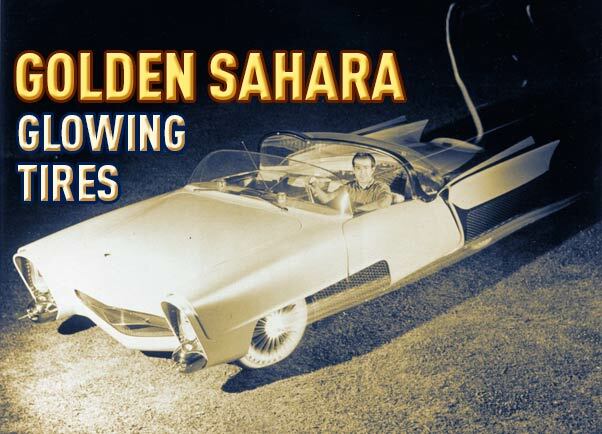 His show car, the Golden Sahara, a remote-controlled, bubble-topped dream, looked extra snazzy in four golden tires. The $75,000 vehicle appeared in the Jerry Lewis movie Cinderfella in 1960 and the TV game show I’ve Got a Secret in 1962. Scientists spent the better part of a decade trying to perfect Neothane tires, but they couldn’t get past the experimental stage. For one thing, the translucent tires had poor traction on wet pavement. They began to lose stability around 65 mph. They began to melt under heavy braking. On top of everything else, they cost more than regular tires. Even if engineers had solved all of those problems, the glowing lights probably would have been too much of a distraction for night driving. Generally speaking, it’s unwise to hypnotize other motorists. This photo was taken at the same location as the color photo with Gloria. Jim could not find a color version of it when I visited him in 2012, but he knew they are around. Hopefully one day we get to see them. This photo is nice, showing both front and rear tires illuminated. Most likely this photo was taken by the Life Magazine photographer at the press day Goodyear tires organised. Open shutter photo of Jim Skonzakes driving the Golden Sahara with illuminated tires and hubs during the night. A special sign Jim had made to promote the Gold Glass Slippers, as he named the GoodYear Tires. 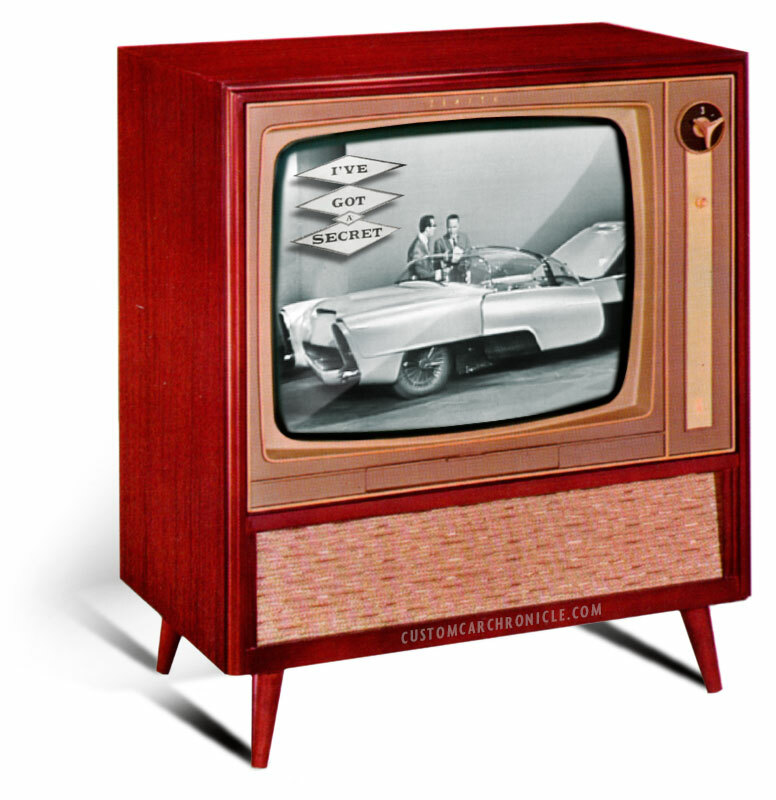 Jim’s Golden Sahara II had a 5 minute special on the June 25, 1962 CBS broadcast of Gary Moore’s I’ve Got a Secret TV show. Jim was able to show off many special features of the car, but the illuminating tires sadly did not show up at all on black & white TV. I knew that at one point this car had clear tires on it but I didn’t know that the lit up.